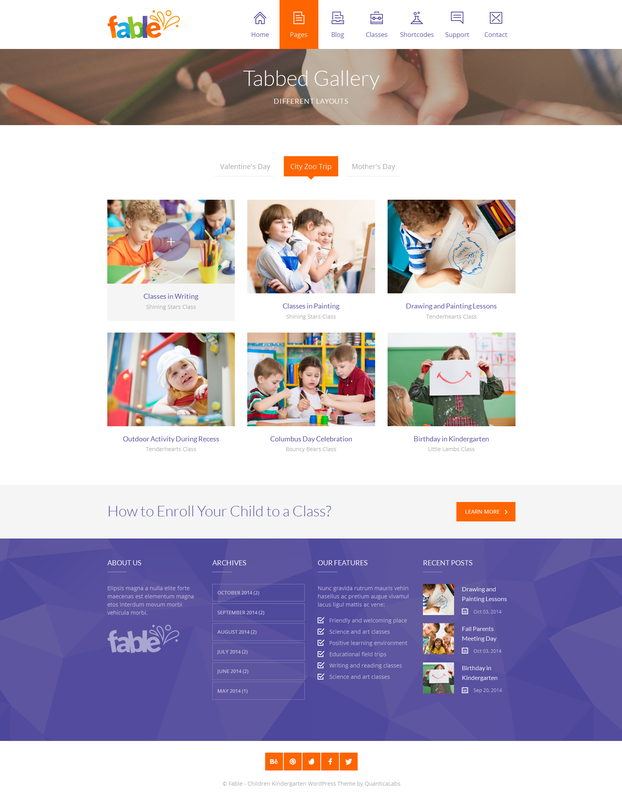 Crafted for kindergarten and preschool, child care and nursery, education and children related endeavors, Fable is a visually impressive, creative and vibrant, well structured, feature rich and responsive WordPress Theme. Fable is a perfect Theme for projects that strongly focus on handling children or related to kids and their growing activities. 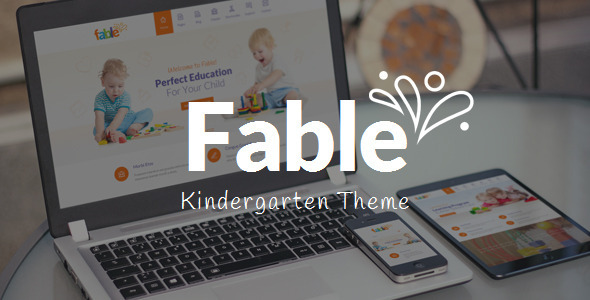 Fable can enhance: kindergarten and preschool, primary school and education related project, child care center and nursery, kids and children related web pages. With Fable, you don’t have to build your site from scratch. It offers various demo pages, widgets, and posts. You can also import pre-made demo content easily with a single click, via the Theme demo data installer and benefit from a fully-functional site in a matter of minutes. For those who wish to build their own page, the drag and drop page builder is available. You only need to click on an element and drag it across the screen. It’s that easy! If you want to use a native WordPress editor, please feel free to access the shortcode generator with 35+ content elements. Fable is fully responsive which means each and every page element is 100% responsive and adapts perfectly for any mobile device. Fable is retina ready. Your site will look crisp no matter the display your user is on. Responsive mode can be disabled in Theme Options Panel. It’s super easy to customize or build your own slider with included #1 Top Selling Slider Revolution Responsive WordPress Plugin with a value of $18. You don’t need additional license and we will keep it up-to-date. You can also use Fable predefined slider along with premium images (these are included in demo package). 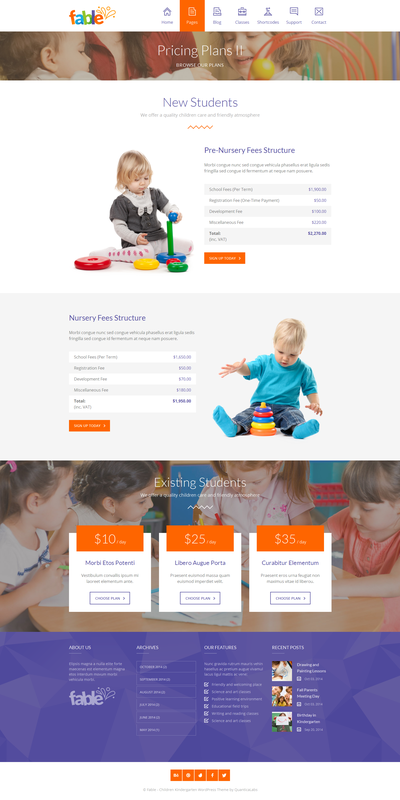 Create your weekly activity schedules, meal menus, event tables, lesson plans or courses with included Timetable Responsive Schedule for WordPress with a value of $18. You don’t need additional license and we will keep it up-to-date. View it in action here or here. The Theme comes with Theme Demo Data Installer under Appearance Menu within admin area. With this panel, you can import a complete set of our Theme Demo pages, posts, widgets and Theme settings with a single click. No need to mess around with XML files! Fable comes with Drag and Drop Page Builder created especially for this Theme so you can build your unique page layout. You can change the order of page sections, you can set full width, wide or boxed layout type, set the background color, video or image with Parallax Effect for each section separately. Page builder comes with 35+ Content Elements like tabs, accordions, buttons, lists, carousels and more. Each component comes with styling options so it is super easy to build unique and beautiful content. For those who prefer to work with a native WordPress editor there is a build-in Shortcode Generator with 35+ content elements. The Theme comes with Theme Options Panel under Appearance Menu within admin area. With Theme Options Panel you can customize global Theme options, blog and post options, menu, footer, logo, favicon, set fonts, turn off responsive mode or add custom CSS for different screen resolutions. Probably the most extensive color configurator panel you could found on the market. With Theme Styles Panel you can change the color of literally any Theme element including hover states and footer components without the need of adding a single line of custom CSS code! 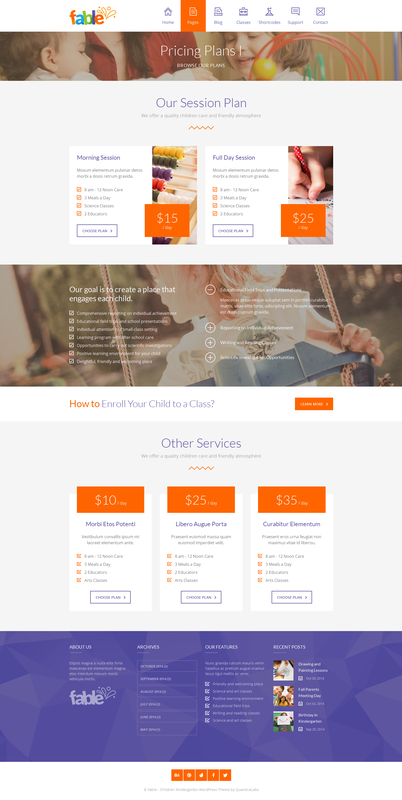 Fable comes with 5 home page layouts including a fully functional scrolling one page layout. Fable comes with several dedicated pages like kindergarten classes and single class page, meal menu page, staff and teacher pages. Build your own online shop with WooCommerce integrated with Fable. All icons by QuanticaLabs. Icons are an integral part of the Theme, please do not use it separately for other purposes. All other images comes with this Theme are licensed under Creative Commons Zero CC0 1.0 Universal (CC0 1.0). You can use it along with this Theme without asking permission. Updated plugin: Slider Revolution Responsive WordPress Plugin. Updated plugin: Theme Demo Data Installer. Updated plugin: Timetable Responsive Schedule For WordPress. Fixed problem with importing Google Fonts (which occurred on some servers). Added new functionalities to plugin Theme Demo Data Installer. Updated plugins: Better WordPress Minify, Slider Revolution Responsive WordPress Plugin.